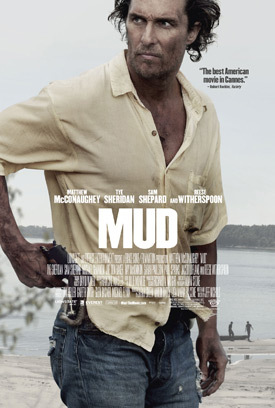 Watch the Movie Trailer for Mud. Matthew McConaughey, Tye Sheridan, Reese Witherspoon and Michael Shannon star in the crime drama. Two boys, Ellis (Sheridan) and his friend Neckbone (Jacob Lofland), encounter a fugitive (McConaughey) and form a pact to help him evade the bounty hunters on his trail and to reunite him with his true love (Witherspoon). MPAA Rating: (PG-13) for some violence, sexual references, language, thematic elements and smoking. Two boys, Ellis and his friend Neckbone, who find a man named Mud hiding out on an island in the Mississippi. Mud describes fantastic scenarios — he killed a man in Texas and vengeful bounty hunters are coming to get him. He says he is planning to meet and escape with the love of his life, Juniper, who is waiting for him in town. Skeptical but intrigued, Ellis and Neckbone agree to help him. It isn’t long until Mud’s visions come true and their small town is besieged by a beautiful girl with a line of bounty hunters in tow.